Cheshire agency Mather & Co will see its concept designs for the 1922 Locker Room at the Pasadena Rose Bowl Stadium come to life this week. The consultancy, working with US agency 49 Degrees, delivered the initial design concepts for the former locker room - used by legends such as Knute Rockne but only used between 1922 and 1928 - and now restored as a museum. “The 1922 Locker Room will showcase the legends that graced the room in the early days and why the Rose Bowl is so important to people and to College Football’s history, but it’s somewhat a mini-showroom of what a large-scale project could look like,” said Dedan Brozino, Rose Bowl Legacy Foundation executive director. The stadium has hosted many high profile matches including the final of the 1984 Olympics men's soccer tournament, and is only one of two stadiums to have hosted the FIFA World Cup finals for both men and women. It also played host to a 2016 International Champions Cup match between Chelsea FC and Liverpool FC. The 1922 Locker Room focuses on more than just the sporting games, including displays about music concerts that have been held in the stadium. 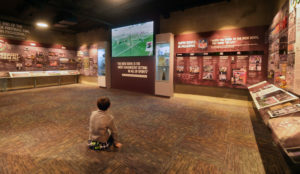 “The 1922 Locker Room is small but perfectly formed – and demonstrates what a much larger sporting museum could be like at the Rose Bowl – hopefully it’s just the start of things to come for the stadium which has a wealth of sporting history,” said Paul Lee, project lead, Mather & Co.